Standing the Patriot Guard Riders' Flag Line is one of the most somber experiences I’ve ever had. Joining the North Texas Patriot Guard Riders was not an easy choice for me, but it was a completely logical one. As Bryan’s family departed the little white chapel where his memorial service had been conducted, we were led off base at Fort Campbell by the Patriot Guard Riders. The procession was headed to the Clarksville funeral home for Bryan’s viewing. The line of Patriot Guard motorcycles extended further than I could see down the highway. Even though we were in an obvious funeral procession, there was one driver that tried to cut into the procession to get on the highway. One of the Riders cut her off, jumped off his bike and proceeded to explain to her – vehemently – that this was a military funeral procession. We found out later that his actions were a bit out of the usual procedure for the Riders and that he should have let the local police handle the situation. But it spoke to me of the passion the Riders have for their mission and especially for the Fallen and their families. We arrived at the Clarksville funeral home, exited our limousines, and made our way to the front doors. Entering that building seemed to me to be the end of everything that I had ever taken for granted. Bryan’s body lay at rest somewhere in there, along with any future hope of looking into his eyes, hugging him, wishing him Happy Birthday or Merry Christmas, watching him play with his kids, or simply sitting on a couch watching a movie with him. I would never again see him eagerly biting into a Whataburger, hear his distinctive laugh, or feel the touch of his hand. So, I didn’t go into the building. I just stood on the sidewalk and watched as people slowly climbed the steps into the funeral home. The feelings of sorrow and grief were coming off everyone so thick it was almost visible. That’s when I saw the Patriot Guard Flag Line. Easily two dozen Riders, standing tall and silent, each of them holding an American Flag ramrod straight, lining the sidewalk on either side of the funeral home all the way out to the street. Their bikes were all parked beside the building, side-by-side, gleaming in the mid-morning sun. It was so quiet right then that I could hear the motorcycle exhaust pipes pinging. The Rider grasped my hand tightly and simply nodded. I went down the entire Flag Line, shaking each Rider’s hand, getting a firm handshake or a hug back. There were men and women in the line, each of them wearing sunglasses, but I could still see a tear rolling down a cheek here and there. Beth came outside then, took my hand, and I reluctantly went into the Funeral Home. A week earlier at Bryan’s Dignified Transfer at Dover Air Force Base, Tiffany had told me that Bryan had left me his motorcycle. That bike was just one of the many regrets I would suffer in the coming days, months, and years. During my last visit with Bryan and Tiffany, he had asked me if I knew anything about motorcycle engines because he couldn’t get his bike started. I told him I only knew how to check the plugs, etc., but that we could take the bike to the local shop to get it tuned up for him. It was, after all, his birthday week and I wanted to do something special for him. He declined, saying we didn’t have much time that week and he wanted to spend it doing other things. So we covered the bike and let it sit. Now, that bike was in my possession. I didn’t ride at the time, but it hurt me so bad to just see it sitting in the garage, unused. We called our local bike shop, had them come pick it up and give it a good tune-up stem to stern. I signed up for a motorcycle safety course in Burleson, passed the class, got my license and began riding Bryan’s bike. 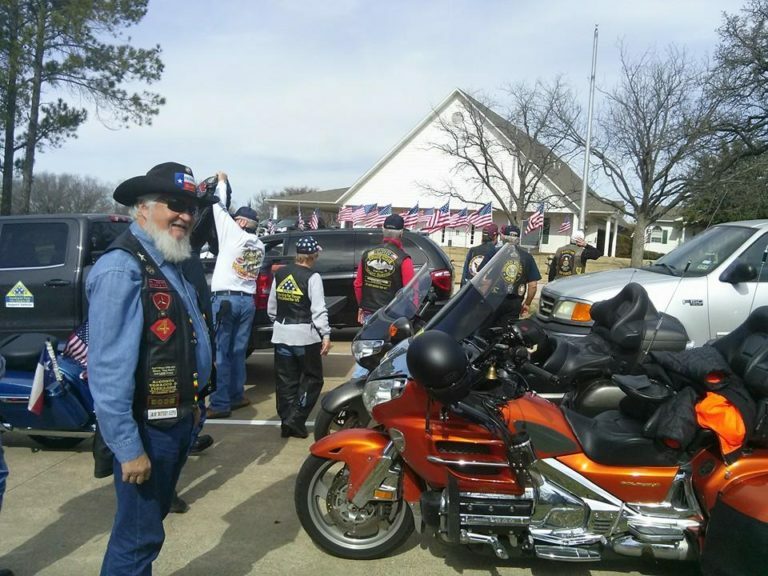 With the encouragement from a good friend of ours, “Weasel,” who was a member of the North Texas Patriot Guard Riders, I joined the PGR and went on my first mission on January 29, 2015. The mission was for a World War II veteran, John S. Hart in Mansfield, Texas. I met a PGR couple there who would become my mentors and wonderful friends, Randy and Niki Smith. With much patience and respect, Randy “showed me the ropes” of standing a PGR Flag Line. I nervously took my place in the Flag Line, gripping the flag pole so tightly in my left hand that my knuckles went white. I thought right then that I had come full circle. I was one of the PGR. I was a Patriot Guard Rider and I was standing ‘Tall and Silent’ for a Fallen Warrior. The Hart family began exiting the funeral home, and a few of them stopped and shook hands with the PGR. A woman stopped right in front of me, took my right hand and said, “Thank you for doing this.” I couldn’t even respond. She had spoken my words of four years ago right back to me. I had come full-circle indeed. I participated in many other PGR missions, each one of them cutting a little deeper into my heart and soul, but I’ll never forget that first Flag Line I saw standing for Bryan, or my first Flag Line I stood because of Bryan. NextGrief is not like a pie. I’m crying as I finish reading your blog. I understand coming full circle, and know how healing it can be. I’m a Gold Star Sister who’s been standing with the PGR for almost 6 years. These men and women have truly become family for me, and I’m glad you’ve experienced the same. This is a wonderful living tribute to Bryan. God bless you. Cathy, Thank you so very much for sharing this with us. Thank you, too, for being a part of the PGR! Our hearts are with you and your family! The Flag Line is a beautiful story. Patriot Guard Riders has filled a void in my life with joy. As a PTSD survivor, I still have an empty place in my heart that my brother once filled. 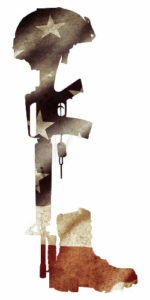 I lost one younger brother after he served two tours of duty in Viet Nam. Over the years I have written poetry to fill the empty places which has helped me survive. Reading The Flag Line gives me an in-depth view into the hearts of military men and women. Knowing your pain is intensified and yet you endure and continue to serve gives me strength to continue too. The fight isn’t over until life itself is over. Thank you for your service to our country. You make each one of us proud to be an American. Wanda, thank you for your comments! Please know that we have so much respect for you, your brother, and your family! Thank you all, from the depths of our hearts, for your service and sacrifice!